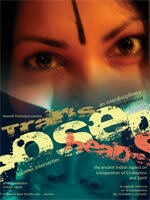 The French artist Nikunja creates the interdisciplinary performance piece "The Transposed Heads" based on the Indian legend of Shridaman and Nanda meeting Goddess Kali and the novel by German poet Thomas Mann based on the same legend. For its realisation he works with Indian movie actress Nandana Sen, who first introduced the legend to him, with contemporary dancer Nadjani Bulin of the French Reunion Islands, with South African top model and performer Venantia Otto, and with the electronic musician and composer Alain Perret of Switzerland who accompanies Nikunja playing the Indian dilruba. The performance, which reflects on the migration of culture, spirit and civilisation, in the individual as well as in the universal consciousness, incarnates the content of the legend until its own artistic form, by proposing interaction between the different medias of art performance (Nikunja), contemporary dance, video performance, video real time composition (by French JeanMarie Pernelle and Indian Dinkar Rao), live sound creation, ritual performance (Venantia Otto) and poetry by Nandana Sen's mother , Padmashree and Sahitya Academy Award winner Nabaneeta Dev Sen and the spectators, who are astonishingly seated in the centre, surrounded by the circle shaped scene, one of the unusual experiences which await the audience. The novel, ''The Transposed Heads,'' - die Vertauschten Köpfe- is a philosophical version by Thomas Mann (German author and Nobel price Laureat in 1929) of an Indian legend about the conflict between mind and body. In a twinned paroxysm, two friends, the intellectual Shridaman and the earthy, beautiful Nanda, behead themselves in a temple in front of an appearance of Indian Goddess Kali. Magically, their severed heads are restored - but to the wrong body, and Shridaman's wife, Sita, is unable to decide which combination represents her real husband. The story is further complicated by the fact that Sita happens to be in love with both men. La nouvelle "Les têtes transposées" (die Vertauschten Köpfe/ the Transposed Heads) est la version philosophique d'une légende indienne par Thomas Mann (écrivain allemand et prix Nobel de la littérature 1929) sur le conflit entre l'esprit et le corps. En un double paradoxe, les deux amis, l'intellectuel Shridaman et le terrestre et beau Nanda, découpent leur têtes dans un temple devant une apparence de la déesse indienne Kali. Par la magie leur têtes découpées sont restaurées, mais chacune sur le faux corps. Et la femme de Shrindaman, Sita, n'est plus en mesure de décider qui est son vrai mari. L'histoire se complique encore par le fait que Sita est amoureux des deux hommes. The legend and the novel, first told to me by Indian actress Nandana Sen, inspired me to create this performance piece, for it directly refers to my specific way of interdisciplinary composition. The end of the legend is the actual beginning of its significance. It is the fact of the transposition between performers, audience and media, between cultures and meaning and the energy which comes with it, which are essential to all performance and art pieces I create. Essentially the creation of the authority space inside the creative authority of oneself for the Other, the Strange/Foreign, the Unknown, the Para dise (para d’ici). 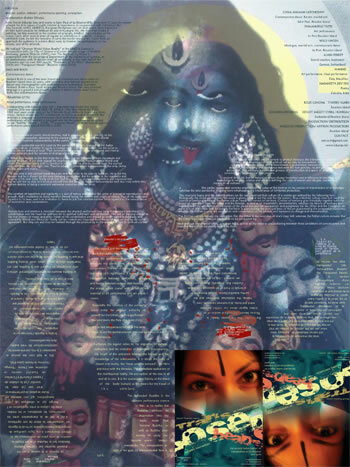 Sita as Kali are spectator/actors at the same time, as are the spectator/actors (the real audience) in my performances. Furtheron the legend refers to the migration of culture, civilization and the evolution of individual consciousness, the touch of the unknown beyond the known and the knowledge of the unknowable. It is about the unity of dream and reality, the “lover and the beloved”, the Here and Now with the Paradise. The immediate realisation of the multilayered reality, the perception of the one in all and all in one. It is the evolutionary history of the travel of the body (culture) as the means for the travel of the spirits (arts). The beheaded Buddha is the ultimate performance mantra to that, as to realise that Buddha, without his body, never had become Buddha, as well as Buddha without his body has become every body/: everybody. The transposition as such is the goal, its flow is spirit. Mann's original warning that ''it requires, if anything, more courage to tell such a tale than to hear it". Thomas Mann adapted the Indian story which is part of the eleventh-century Kathasaritsagar collection. The Indian writer Girish Karnad, in turn, wrote a dramatized version of the story in which he drew upon Thomas Mann's novel ("Die Kopfvertauschung in Die vertauschten Köpfe - Vetalapanchavimsati - Hayavadana"). La légende et la nouvelle m’ont été d’abord racontées par l’actrice indienne Nandana Sen in Mumbai et m’ont inspiré la création de cette pièce de performance, car elles réfèrent directement à ma façon spécifique de composition interdisciplinaire. La fin de la légende est véritablement le début de sa signifiance. C’est le fait de la transposition entre les performeurs, les spectateurs, et les médias, entre les cultures et entre significations et l’énergie qui se développe de cette transposition, choses qui sont essentielles en toutes les pièces de performance et d’art que j’ai créées. En essentiel c’est la création de l’espace d’autorité à l’intérieur de l’autorité créatrice de soi-même vers l’Autre, l’Etrange, l’Inconnu, le Paradis (para d’ici). Sita et Kali sont des actrices et spectateurs à la fois, comme seront les spectateurs/acteurs (le vraie public) dans ma performance. En plus la légende s’interroge sur la migration des cultures, des civilisations, et l’évolution de la conscience individuelle, l’expérience de l’inconnu au delà du connu et la compréhension de l’incompréhensible. Elle est concernée par l’unité entre le rêve et la réalité, l’amant et l’aimé, l’ Ici et le Maintenant avec le Paradis. La réalisation dans l’immédiat des multiples couches de la réalité, la perception de l’Absolu dans le Tout et du Tout dans l’Absolu. Le Buddha décapité est le mantra performatif ultime à cette conception, en réalisant que le Buddha, sans son corps, jamais serait devenu Buddha, ainsi que Le Buddha sans son corps devient tout les corps, devient tout le monde. La transposition en soi est le but, sa fluidité est l’esprit. At the entrance the public will be filmed one by one on dv cam registering directly on dvd, and photoshot with digital cam, which then will be immediately printed out on a cheep color printer on A4 format. The desired/preferred stage constellation would be that the stage is in a circle around the spectator’s area, so that each spectator is looking from inside a circle onto the part of stage he can see from his place. He can turn his head and posture to see other parts of the stage. The chairs are freely displaceable, so the spectator can change his position. By doing so, the spectator could choose another direction of his view but also relates to the other spectators, for he could find himself face to face to another member ofg the audience. Through the circle of at least 20m diameter leads a small corridor of about 2m wide which cuts the circle in half and which allows the performers to intervene in the spectator’s space. If there is the regular theatre situation, then from the stage would lead a long catwalk into the audience area to a large screen with the prerecorded video projection. Opposed to that will be a projection in real time of the performer exchanging 2 masks and washing her body with milk. There are two screens for the two video realtime projections and one screen for the video projection. The projectors are at least 5000 luminem depending on the distance from the screen and the size of the screens. There are 18 regular TV screens of different formats between diameters 51 to 80cm connected to 3 dvd players. There are 18 wooden buddha statues of sizes between 40 and 90cms (watch weight so that it is easy to handel for Kali-performer)assorted to the TVs. A prerecorded videoperformance as video projection showing male and female dancer bodies (framed without heads) covered with butter and drawing signs/letters/words into the butter with sticks. There are some splashes of color. A female performer (Nandana) is acting as Kali. She has different acts she would interchange according to her inspiration and composition: Her performance’ quality oscillates between “acting” and “performing”. 1. 1	The 18 Buddhas: There is a stand up electric saw. There are 18 wooden Buddhas of a size of between 40 and 90cm height (please check weight). The performer would pick up a Buddha from his place where he is installed on the stage (distributed all over the stage together with the TV screens showing the spectators heads) and cut off his head with the saw. She would put the head in a small pink plastic bag and hang the head around her neck on a long pearl necklage. She would put back the headless sculpture at the place it was before. The performer is wearing a black swimwear or lingerie and red high heel shoes. She looks very attractive. Sometimes she interacts with Nikunja, painting the Tibetan prayer flags (transorming buddha performance 2000) who would paint the heads by imprinting on it paint off his body. 2. Kali/Nandana has a series of poems to read out or better recite by heart in Bengali and English accompanied by a theatrical/actors interpretation (e.g. choosing a personality as interpretator of the poem, a fictional figure to the poem, e.g. expressed by a certain emotional state and the costumes) , poems by her mother, like the exile poem, etc, to be chosen. 3. Kali/Nandana interacts with AfricaCultureQueen/Venantia. 5. Kali/Nandana interacts with the dancer couple as a dancer. 6. Kali/Nandana interacts with Nikunja/Shrindaman, cutting his clothes a part and cutting off his painted hair, putting them into the small plastic bags and handing them out to one of the spectators at irregular moments of the performance. Performs her ritual of washing herself with milk and appearances/disappearances with two African masks. performs the “Transforming Buddha” performance : he paints on his head and chest and imprints the paintings on a long series of tibetian prayer flags, suspended on a cord across/along a part of the stage. He will also play the dilruba creating parts of the life sounds with Alain Perret. There is a male and a female dancer. The female dancer is present from the beginning and dancing in a fusion of classical Indian dance /contemporary dance the story of Kali, the two friends and the wife, while moving all along the stage. There might be interaction with Nandana, Nikunja and Venantia. She is also the scenical figure of Sita in the second part, after the reunion of the Head and the Body. The male dancer comes in, after the “transforming buddha” performance is accomplished. It is the time when the heads would be put back on the bodies by the loving woman. Then there is the dance, a tantric love dance mixed to constant reexamination of the body situation, emotionally, physically, mentally and spiritually, between the couple, whereas there is a clear separation of relation of the woman to the man’s head and the man’s body as if there were two different beings. Nikunja would paint the mail dancers top of head and middle of the back what would leave marks on the female dancers dress and body. Kali/Nandana would “comment” the dance as a dancer or by doing gestures and cutting faces and stick the spectator’s portraits (the A4 photo prints) to the string of prayer flags as well as to the bodies of the dancers, as well as on her body, as well as on the headless Buddhas, as well as on Venantias dress. When she does not have any photos left, she would leave the stage, taking with her Venantia, and finally the dancers who would follow her. Swiss electronic musician Alain Perret and Nikunja create the sounds live to interact directly with the happenings on stage. The sounds will be recorded on m audia. They cooperate with Geneva based sound engineer Benoit Saillet. A son entrée, chaque spectateur sera filmé à l'aide d'une caméra digitale enregistrant directement sur un dvd, et aussi photographié avec un appareil photo numérique; les photos qui seront immédiatement imprimées en couleur par une imprimante bon marché sur du papier de format A4. La constellation désirée pour la scène serait que la scène forme un cercle autour de l’espace des spectateurs, qu’ainsi chaque spectateur puisse regarder la partie du cercle de la scène devant lui, mais qu’une partie de la scène soit aussi toujours invisible. Le spectateur pourrait tourner sa tête pour voir d’autres parties de la scène en cercle autour de lui. Les chaises pourraient être déplacées, ainsi qu’il serait possible de choisir une autre direction, maison peut également se mettre en rapport avec les autres spectateurs, car on pourrait se retrouver face à face avec un autre membre de l’audience. A travers le cercle de minimum 20mètres de diamètre se trouve un chemin d’environ 2m de large, qui coupe le cercle en deux et qui permet aux performeurs d’intervenir dans l’espace des spectateurs. Il y a deux écrans pour les deux caméras qui transmettent des images en temps réel et un écran pour la projection vidéo. Les projecteurs sont d’une puissance d’au moins 5000 luminem en rapport avec les distances aux écrans et la largeur des écrans (autour de 6 x 4 mètres chaque une). Il y a 18 téléviseurs normaux en différents formats entre 51 et 80 cm de diagonal d’écran, connectés à 3 lecteurs dvd. Il y a 18 statues de Bouddha en bois entre 40 et 90cm de haut (attention au poids car ils doivent être manipulés par le performeur de Kali), qui accompagne les téléviseurs. Pour une situation “classique” en théâtre, il fallait créer une longue « catwalk » dans l’espace des spectateurs avec à la fin le grand écran avec la projection de la bande vidéo préenregistré. Opposé à cet écran il y aurait un seul écran avec une projection en temps réel. Une performance vidéo préenregistrée en tant que projection vidéo qui montre des corps de danseurs hommes et femmes (cadrages sans têtes) couverts de beurre et qui dessinent des signes/mots dans le beurre avec des bâtonnets. Il y a des tâches de couleurs. Un performeur femme (Nandana) a le rôle de Kali. Elle performe des actes variées qu’elle interchange selon son inspiration et volonté de composition. 1. Les 18 Bouddhas. Il y a une scie électrique sur pied. Il y a 18 Bouddhas en bois d’une hauteur entre 40 et 90cm (svp attention au poids). Le performeur prend un Bouddha de sa place ou il est installé sur scène (distribués à travers la scène comme les téléviseur qui montre les têtes des spectateurs) et coupe sa tête avec la scie. Elle met la tête dans un petit sac a plastic rose et lui attache à une corde en perle autour son cou. Elle remet la sculpture sans tête à la place ou elle était au par avant. Elle porte un maillot de bain noir ou lingerie et des chaussures à haut talon rouge. Dès fois elle interagit avec Nikunja qui est en train de peintre les drapeaux de prière tibétain (transforming bouddha performance de 2000) qui imprime de la peinture sur la tête d’appart de son corps. 2. Kali/Nandana a des poèmes de sa mère qu’elle lit ou qu’elle récite par cœur en Bengali et anglais les accompagnant par des interprétations théâtrale, des poèmes à choisir. 3. Elle interagit avec Venantia/African Queen. 4. Kali/Nandana a une série de petit objet de sa vie personnelle, qu’elle prend d’une table et présente au spectateurs individuellement et performe une action spontanée autour de cette objet. 5. Kali/Nandana danse avec le couple danseur de temps en temps. 6. Kali/Nandana interagit avec Nikunja/Shridaman, coupe ses habits et ses cheveux peints, les mets dans des petits sac en plastique et les offre aux spectateurs ou s’accroche autour le cou à des moments irrégulière de la performance. Elle performe la performance rituelle en se lavant avec du lait et en créant les apparences et disparition de sa face derrière deux masques africains. Elle et filmé en temps réel et ses mouvements sont visible sur l’un des écrans. Il performe la performance “Transforming Buddha” crée en 2000 pour la télévision Suisse TSR. Il peint avec de la peinture à l’huile sur sa tête et son corps et fait des empreintes sur des drapeaux tibétains de prières, qui sont suspendus à travers la scène sur une longue ficelle. Il joue aussi le dilruba pour la création de son avec Alain Perret. Il y a deux danseurs hommes et femmes. La danseuse est présent dès le début de la performance et danse une pièce qui fusionne la danse indienne et contemporaine. Elle raconte l’histoire de Kali et de la transposition des têtes. Il va avoir des interactions avec Nandana, Nikunja et Venantia. Elle est aussi la figuration de Sita dans la deuxième partie quand elle aurait réunit les têtes avec les corps. Le danseur hommes va intervenir après la fin de la “Transforming Buddha” performance de Nikunja. C’est le moment après que Sita amante aurait remit les têtes sur les corps. Le pas de deux entre les danseurs serait une danse tantrique en interchangant avec une sorte d’inspection du corps et de la situation corporelle, des corps émotionnel, physique, mental, et spirituel, entre le couple. Il y a une clair différence dans la façon comment la danseuse agit envers le corps et la tête du danseur, comme si ils seraient deux être différents. Nikunja va peintre sur la tête et sur le milieu du dos du danseurs ce qui va laisser des traces sur le corps et les habits de la danseuse par leur interaction. Kali/Nandana “commentait” la danse entant participante ou en regardant et en faisant des gestes et grimasses, et colle les portraits des spectateurs sur papier à la ficelle des drapeaux tibétains, comme sur les corps des danseurs, comme sur son propre corps, comme sur les Bouddhas sans têtes et sur le costume de Venantia. Quand elle aurait plus des photos elle quitterait la scène.